Navtej Singh Johar is one of India’s leading male dancers and choreographers whose work traverses freely between the traditional and the contemporary. Trained in Bharatanatyam at the Kalakshetra, Chennai, he also studied methodologies of dance scholarship at the Department of Performance Studies, New York University. His continual attempt at forging a space for freedom in dance is closely informed by a scholarly enquiry into the complex sociopolitical history of Indian dance; his choreographic work revolves around issues of boundaries, body and identity. Widely traveled, Johar has performed, lectured, choreographed and conducted workshops at prestigious venues all over the world. 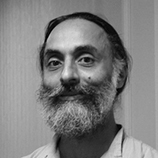 In 1996, he received the Times of India Fellowship to research the sociopolitical history of Bharatanatyam; the Charles Wallace Fellowship in 2000, a University of Michigan residency and the Sri Krishna Gana Sabha Award for abhinaya in 2010. He is the founder of Studio Abhyas (New Delhi), a nonprofit organization dedicated to dance training, yoga, humane urban design and the care of stray animals. For further information please consult www.abhyastrust.org.